Before there were Calm Sleep Stories there was Bob Ross. Now, at last, Calm brings you both at once. We've stripped away the visuals of Bob Ross' famous old show, The Joy of Painting, and reinvented the audio as a Sleep Story to help you settle into slumber. It launches in the Calm app on June 4th and is called Painting with Bob Ross. Bob Ross, the 1980s art instructor and TV host of The Joy of Painting on PBS, was best known in his day for his mellow manner, giant perm and quirky sayings about art and life. The playful wisdom of his maxims, typically dispensed as throwaway remarks about the craft of painting, prompted fans to dub Ross “the guru with the paintbrush”. They’ve also helped earn him, since his death in 1995, a remarkable second life as an Internet celebrity and pop culture icon. His chill vibe and baritone voice that barely rose above a whisper has lulled many a restless soul to sleep. The soothing swish-swash sound of his paintbrush against the canvas only heightened the calming effect. Bob Ross, in other words, managed to be both a walking natural insomnia cure and a kind of barefoot philosopher, known for his off-the-cuff insights and adages. 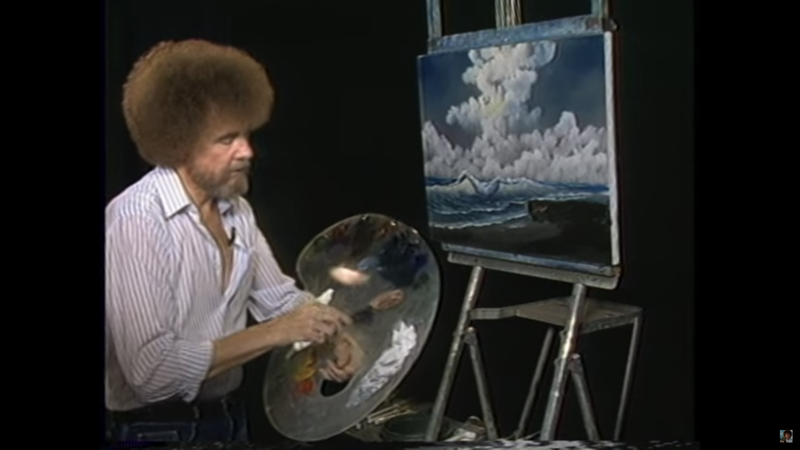 Indeed, scientists have lately identified “the Bob Ross effect” and claimed that Ross was an unwitting pioneer of the brain-tingling sensation known as “ASMR” (or Auto Sensory Meridian Response”) that induces a sense of euphoric relaxation. In celebration of the release of Calm's Bob Ross Sleep Story, we gathered together 10 of our favorite Bob Ross quotes. So often, Bob Ross seemed to be talking about painting but was in fact also talking about life. That was part of his magic: every art lesson turned out also to be a life lesson. We see Bob Ross as an early and perhaps unwitting pioneer of mindfulness, before the term was widely used. His sayings were playful, wise and very mindful. He was ahead of his time, in so many ways. Thanks for your wisdom, Bob Ross.